Sturtevant, WI (October 6, 2010) Topper Industrial, a leader in material handling solutions has caught the attention of the military. 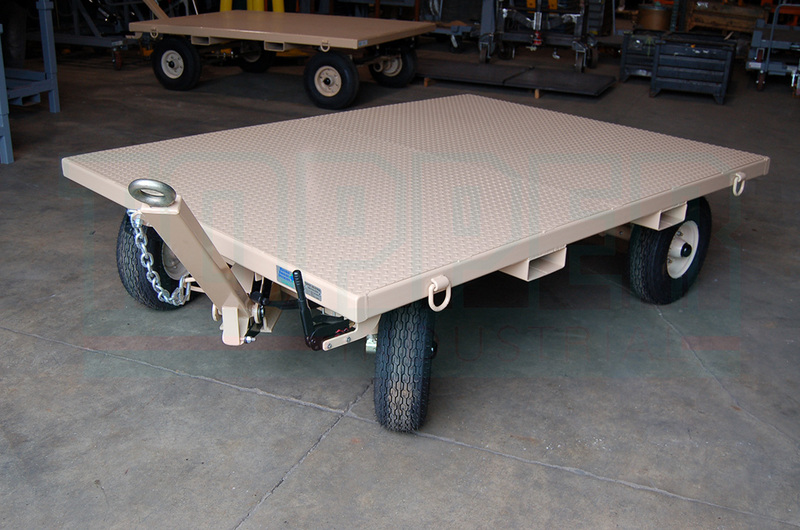 Topper has manufactured a 6 ft. x 8 ft. heavy duty trailer referred to as the Air Force Trailer. The trailer is equipped with a suspension speed rated at 3,000 pounds. It also has front axle spindle steering and comes with a powder paint finish. The tires on the trailer are made specifically for off roads, all terrain towing (including sand terrain). The primary use of the cart is to carry large portable generators (or air compressors) on top of its frame to be pulled through remote area such as combat zones. The trailer even comes with a manual parking brake. The Air Force Trailer is a breakthrough in industrial cart design because it makes for an easy-steering, rugged cart that can hold up through tough terrain. Check out some other examples of industrial carts that Topper makes here.